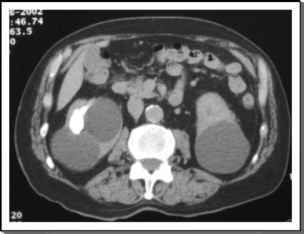 With the increase in cross-sectional imaging studies, computed tomography has become a more reliable modality for diagnosing renal cysts and differentiating them from other renal lesions such as a solid neoplasm. 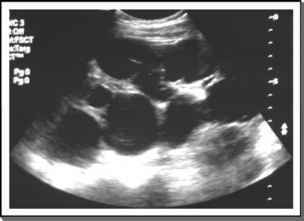 FIGURE 1 ■ Renal ultrasound of a patient with multiple simple renal cysts. Note the sonolucent nature of cysts displaying through transmission with thin walls, absence of nodules, septations, or calcifications. The advantage of laparoscopic decortication of symptomatic renal cysts. Include the ability to address multiple, peripelvic, and bilateral renal cysts in a single operation, while minimizing incisional morbidity. Since its description, both transperitoneal and retroperitoneal laparoscopic approaches have been evaluated with excellent success rates. FIGURE 2 ■ Contrast enhanced computed tomographic image of a patient with left peripheral renal cyst and right peripelvic renal cysts. Note: The peripelvic cysts are causing compression and obstruction of the collecting system. No enhancement within these cysts was noted after intravenous contrast administration. ■ A smooth cyst-parenchymal interface (Fig. 2). Enhancement of a renal lesion following the administration of gadolinium suggests the likelihood of a solid neoplasm, whereas a simple renal cyst does not enhance and appears homogeneous with low signal on T1-weighted images and high signal on T2-weighted images. Measurement of Hounsfield units within a simple renal cyst confirms the presence of water density (Hounsfield units of 0-20). Comparison of Hounsfield units prior to and following intravenous contrast is also helpful in differentiating a simple fluid-filled cyst (no significant enhancement postcontrast) from a hyperdense cyst (precontrast Hounsfield units higher than water density but no significant enhancement postcontrast) or a solid-enhancing mass (postcontrast enhancement difference of > +10 Hounsfield units). Like with ultrasound, computed tomography provides information regarding the presence or absence of septations, mural nodules, and calcifications. Bosniak classification makes use of this information for categorizing renal cystic lesions with respect to risk of malignancy (Table 1) (17). Such classification ranges from Bosniak I lesions (i.e., simple benign renal cyst) to Bosniak IV lesions (i.e., highly suspicious for cystic renal neoplasm). For patients with a known history of autosomal dominant polycystic kidney disease, von Hippel-Lindau syndrome, tuberous sclerosis, or acquired cystic renal disease, each cyst should be evaluated separately to determine the likelihood of malignancy. Two- and, more recently, three-dimensional computed tomography images provide excellent anatomic information of renal units as well as the proximity of the renal cyst(s) to surrounding structures (e.g., spleen, liver, lung, adrenal, small and large bowel, renal vessels, or collecting system). 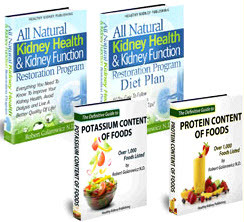 Review of such information can prove useful when planning therapeutic intervention such as percutaneous, laparoscopic, or open surgical drainage of a renal cyst.